Making sure you have the right tools for the right job is imperative – having the wrong tools is just a pain and hinders your work. Maintaining a planted aquarium can be a little tricky and the Easy Aqua Plant Tool Set could be just what you are looking for. So what are the used for? 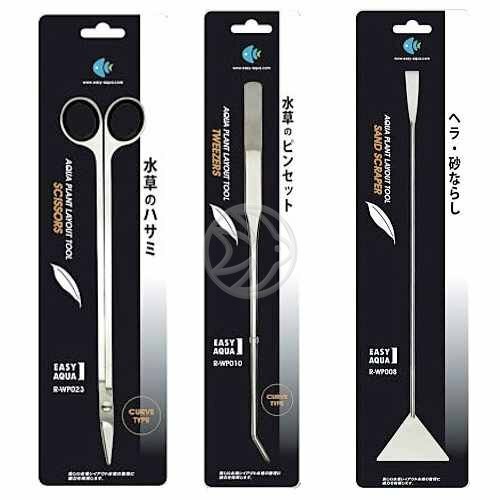 Scissors – perfect for trimming plants. The curved tip makes them particularly suitable for foreground plants and you get a great angle for trimming plants that are normally hard to reach. Tweesers – really useful when you need to plant up. Pushing your fingers into the substrate is cumbersome. Tweesers will not disturb your substrate making your work easy. Sand & Gravel Scraper – once you’ve finished maintaining your tank, use this to gently move the substrate back to where you want it to be. Fish Net – for catching your fish before you clean. Gravel Rake – for maintaining the gravel and keeping it tidy. Plant Fork – for attending to your plants. Cleaning Sponge – for cleaning the glass of the aquarium. Each tool detaches easily which means you can swap over in seconds which makes it quick to clean your entire aquarium and make it look pristine again! For more maintenance tools please visit this link.